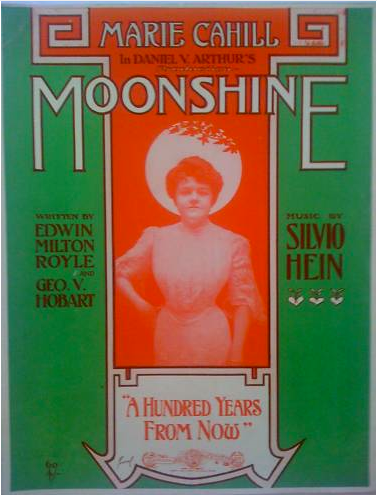 This is the front page of the sheet music for the number A Hundred Years From Now, written by Silvio Hein and Edwin M. Royle with George V. Hobart, for the musical Moonshine. The musical ran on Broadway at the Liberty Theatre from 30 October, 1905, until 2 December, 1905, and at the Majestic Theatre from 25 December, 1905, until 6 January, 1906, for a total of 53 performances. Marie Cahill, a popular performer at the time, sang the number in the musical. When Bear Family Records issued their major collection, Flatt and Scruggs 1948–1959 in 1991, they seem to have assumed that this very early use of the title A Hundred Years From Now meant that the Flatt and Scruggs 1957 recording was one and the same, so the track list showed Hein and Royle in the writers credits. But the theme of a hundred years from now inspired others to provide other musical works. For example, in 1914 a song called A Hundred Years From Now was copyrighted by O. E. Story of Massachusetts and published in sheet music form. 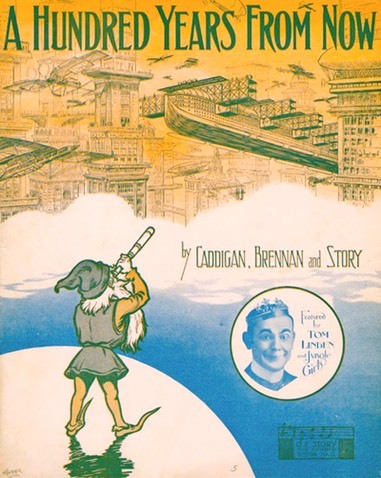 The number was written by Caddigan, Brennan and Story and the amusing sheet-music cover indicates that it was sung by Tom Lindey and Jungle Girls.